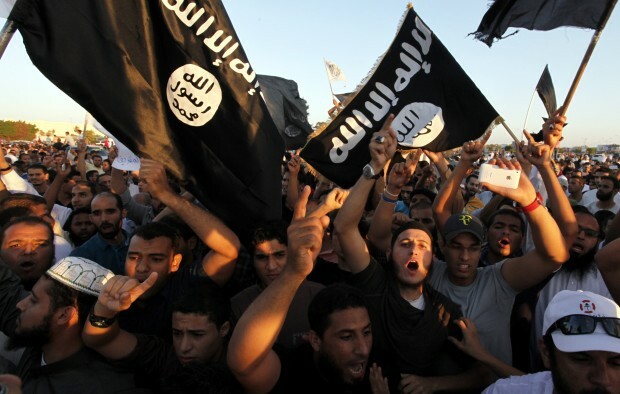 Libyan followers of Ansar al-Shariah Brigades and other Islamic militias, hold a demonstration against a film and a cartoon denigrating the Prophet Muhammad in Benghazi, Libya, Friday, Sept. 21, 2012. AP Photo/Mohammad Hannon Source. For months the international community has been acting as if both sides in Libya’s multi-faceted civil war are equally to blame for the unfolding tragedy, in effect justifying standing back and doing nothing, much like in Syria. Such even-handedness is symptomatic of the failings of international policy with regard to Libya, reflecting an exasperation with the complexity of the conflict that could potentially lead to further disastrous results. The other side, loyal to the illegitimate government that has seized power by force in Tripoli, has sought to institutionalise a state of permanent revolutionary zeal, regardless of the general will of the Libyan people. Desperate for allies, the so-called Libya Dawn movement has, perhaps misguidedly, partnered with violent jihadis and helped groups loyal or akin to Isis to establish a north African beachhead. Far from reflecting the will of the people, it has explicitly rejected public sentiment as counter-revolutionary. In other words, it is madness to treat both sides equally. The situation could escalate to Syria levels. The Islamists are flirting with really bad guys and should not be supported. But don’t expect any changes. The leadership of the Western World is not in good hands.